This is a nice early Art Glass vase. Quality vibrant colored glass construction with ground pontil. 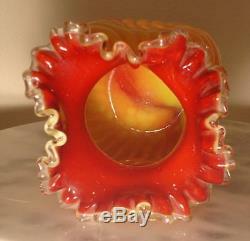 This Vase shows an Opaque Yellow outer layer in a Swirl Rib Optic patter and Ruby glass lined with an applied Clear Crystal edge at the ruffled top. Some reference books attribute this color combo to Sandwich glass. Most likely it's Bohemian and made by Franz Welz c. It stands 5 1/4 tall. Any unusual white or dark spots shown in the photos are from camera glare. This will make a great accessory to any Victorian home. 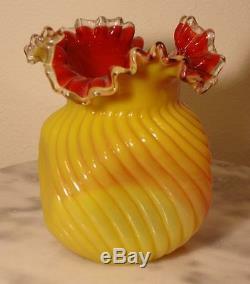 The item "Victorian Bohemian Art Glass Vase Opaque Yellow Swirl Rib Optic Ruby Lined" is in sale since Sunday, December 21, 2014. This item is in the category "Pottery & Glass\Glass\Art Glass\Bohemian/Czech\Other Bohemian/Czech Art Glass". The seller is "ainventor" and is located in Gibsonton, Florida. This item can be shipped worldwide.